Corked 2018 – Monterey County Pops! SOLD OUT! We look forward to seeing everyone who purchased their tickets. If you are still hoping for a ticket, they’ve all been sold but there is always a chance for a last-minute opening. Give us a call at 831.596.7329 and we will try to find you space. 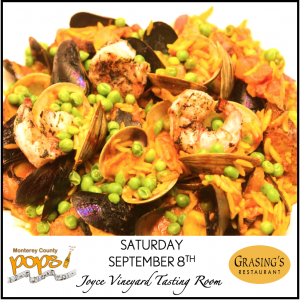 Enjoy an evening with wine from Joyce Vineyards, paella prepared by Grasings Coastal Cuisine, and music benefiting the Monterey County POPS! on Saturday September 8, 2018 from 6:30pm to 9:30pm at Joyce Vineyards (1 East Carmel Valley Road, Carmel, CA). The evening features an open bar with a wide selection of Joyce Vineyards wines, paella cooking demonstrations, and a live auction. John Wineglass will be performing live music throughout the evening. In 1999, Mr. Wineglass earned a master’s degree in Music Composition: Film Scoring for Motion Pictures, Television and Multi-Media at New York University, studying with Justin Dello-Joio, D.M.A. of the Julliard School. His passion for music has also led him to develop proficiency as a gospel and contemporary jazz pianist. This wide array of musical prowess has afforded Mr. Wineglass opportunities to perform on five continents, before every U.S. president since Ronald Reagan, and to regale numerous world leaders, including former King Hussein of Jordan and Chancellor Mikhail Gorbachev of the Soviet Union. 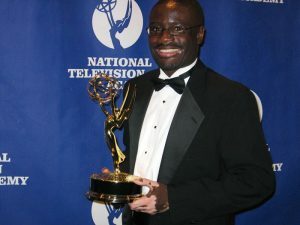 As a recipient of three (two consecutive) 2001-2005 ® Daytime Emmy Awards for Outstanding Achievement in Music Direction and Composition for a Drama Series, and three 2002-2005 ASCAP Film and Television Music Awards, Mr. Wineglass holds five ® EMMY nominations and has served as composer and conductor for The Film Society of Lincoln Center’s Silent Film Festival. Here, he premiered two original scores, namely: “Tired of Giving In” (a short animated film about Rosa Parks) and “Gabriel Goes for A Walk” by New York University Tisch School filmmaker Karl Staven.